A relatively new, FDA-approved treatment for glabellar lines (frown lines between the eyebrows), Xeomin also reduces facial wrinkles, forehead lines and crow's feet. It stops muscles from moving at the injection site, which reduces lines and makes skin look smoother. Lines, wrinkles and crow's feet form after repetitive smiling, frowning and other facial expressions. Like Botox, Xeomin temporarily freezes muscle activity in the target areas. Xeomin treatment at MyBotoxLA usually lasts from 10 to 20 minutes, so you can stop by our office on your lunch hour. You'll see full results in 7-10 days. One Xeomin treatment keeps your skin smoother and gives your face a more relaxed, alert appearance for about 3 months. Line and wrinkle improvement varies among patients. Ask us about the best Xeomin treatment schedule for your skin. Although wrinkles and lines will gradually return after 3 months, you'll notice they'll be softer and less prominent. This occurs because your facial muscles are being trained to relax. If you're looking for a safe, non-surgical anti-aging treatment for frown lines, wrinkles or crow's feet, Xeomin offers a choice. We'll cleanse the area to be treated, then ask you to smile, frown or look surprised. This activates the muscles to be treated. After identifying the target area, we may outline it with washable marker. Injection follows, with a normal treatment consisting of 6 to 25 Xeomin injections. The number of injections during your treatment depends on the size of the target area and the severity of your frown lines, wrinkles or crow's feet. After treatment, your brows may appear lifted and your eyelids may have an open look. Xeomin refreshes your face, giving it a more pleasant, vibrant look. If you find that frown lines between your eyebrows or forehead lines make you look old, tired or angry, Xeomin can help! After a Xeomin injection, the treated area may look like a mosquito bite for up to 60 minutes. Any redness should fade within hours. If you have bruising, it may take 7 to 10 days to fade. You can cover up bruises with make-up anytime after Xeomin treatment. Don't take aspirin or any blood-thinning medication or supplement for 2 days after treatment. Don't lie down for 2 to 4 hours after treatment to maintain placement of the injectable. Should I Choose Botox or Xeomin? Xeomin and Botox both contain neurotoxins to temporarily paralyze facial muscles in the treatment area. This softens any wrinkles, lines or crow's feet caused by facial movements. Botox and Xeomin provide roughly the same overall results for most patients. There is one major reason some patients may benefit more from Xeomin than Botox, and it has to do with how the product is made. Xeomin facial injectable uses the same natural components offered by Botox's main ingredient, the bacteria Clostridium botulinum, but unlike Botox, Xeomin has no additives. 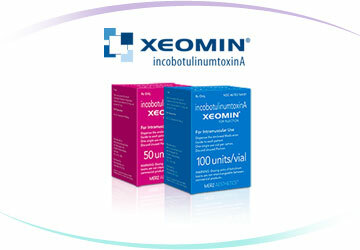 Xeomin is formulated from incobotulinumtoxinA, a Type A botulinum toxin. It's a neurotoxin that stops muscle activity in the treatment area by blocking contraction-causing chemicals. Xeomin contains only active components, as the manufacturing process removes dormant ingredients. You'll receive 100% pure neurotoxin during the treatment to freeze muscle activity and make your skin smooth and line-free. If you haven't responded to Botox injections, it may be due to the antibodies forming around proteins in Botox's main ingredient. Patients who see poor results with Botox may respond well to Xeomin. There's less risk of an allergic reaction to Xeomin, since it is a "naked" neurotoxin without added proteins. If you've tried Dysport, another type of botulinum toxin used to smooth out frown lines between the eyebrows, and gotten less than stellar results, Xeomin may work better for you. Some patients experience minor bruising, itching or swelling at the injection site. Neck pain, headaches or redness are less common. Discuss any possible Xeomin side effects with us prior to treatment.